Updated: Aug. 25, 2014 at 2:05 p.m. The University formalized punishments for off-campus noise and trash violations for the first time Friday, unveiling sanctions that escalate to suspension in an attempt to soothe GW’s fractured relationship with Foggy Bottom neighbors. The sanctions, which mark the first time GW has laid out standardized disciplinary actions for off-campus issues, will give students fewer free passes before officials deliver formal punishments. The rollout comes after a year of neighbors’ intense lobbying for GW to impose harsher penalties on students who disrupt the otherwise-quiet neighborhood. Neighbors say students haven’t taken the University’s disciplinary procedures seriously in the past, but they hope the formal sanctions will stop disruptive behavior in the area. “It will hopefully make anyone who wants to offend over and over and over again think twice because there are going to be some actions that are going to matter,” said Marina Streznewski, president of the Foggy Bottom Association, who has lived in the neighborhood for more than a decade. 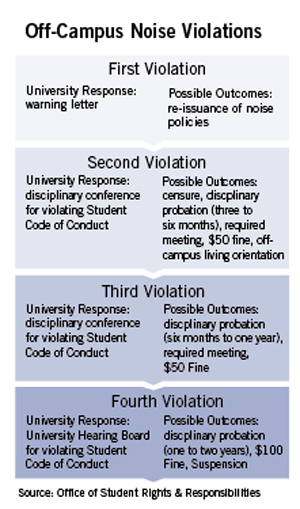 While GW will determine consequences on a case-by-case basis, most students will be slapped with a $50 fine after their second noise offense and also will be put on disciplinary probation for as many as six months. After the fourth violation, a student could have to pay a $100 fine and be put on probation for up to two years or even face suspension. Violations for trash-related issues, like having garbage on the property or failing to put trash cans in the right place for pick up, range from having to retake GW’s online off-campus living course for a second violation, to a $50 fine and six months to a year of disciplinary probation for a fourth violation. Diana Tiberi, another Foggy Bottom resident who is also a property owner and manager in the neighborhood, said the new punishments show GW is taking serious steps to mend its relationship with the community. University President Steven Knapp told a group of neighbors during a Foggy Bottom Residents Alliance meeting in April that past disciplinary policies had kicked in after the third or fourth infraction, and pledged to place harsher sanctions on students who did not follow the rules. Under the new rules, students will face punishments on the second infraction. In 2012, the Office of Off-Campus Student Affairs released a guide for students living off campus, which explained that they can still face consequences for violating the Student Code of Conduct, though it did not list specific punishments. Dean of Student Affairs Peter Konwerski said the new sanctions reflect the University’s commitment to improving relations with Foggy Bottom neighbors. “This updated disciplinary process will allow us to provide a standard university response to off-campus conduct violations using a range of educational options to address various behaviors,” he said in a release. The Office of Community Relations declined to comment through University spokesman Kurtis Hiatt on how officials determined the consequences. Hiatt also declined to say why the University chose to announce the changes Friday, or whether the policies were enacted because of a rise in trash and noise violations. Last August, after two decades of tension between Foggy Bottom neighbors and GW students, the Foggy Bottom Residents Alliance began increasing pressure on the University to change its off-campus policies. The organization began meeting with top administrators to air their grievances, claiming the University did not prioritize their complaints about disruptive students. Officials then announced they would require members of Greek life living off campus to register their address with the University, but administrators later backtracked on the policy. They also created an online complaint form for neighbors to report violations. Between June 2012 and 2013, there were 82 phone calls made through the hotline GW provided to Foggy Bottom neighbors to report off-campus incidents, according to a report from the Office of Off-Campus Student Affairs. At least five students were put on probation for off-campus violations. Students living on and off campus are now required to complete an online module about how to be a “good neighbor.” The course, which includes videos as well as information about trash pick up, noise regulations and alcohol laws, is mandatory for all students and must be completed by Sept. 19. Streznewski said requiring students to participate in online orientation is also a good way to teach the fundamentals of living independently, such as taking out the trash and knowing their rights as a tenant. “When you haven’t lived on your own before, understanding that these are new responsibilities, there’s a period of education that has to take place,” she said. Still, other residents think the sanctions will not change students’ attitudes. Foggy Bottom resident Kenneth Durham said he is skeptical because efforts to educate students about off-campus housing in the past have failed to reduce disruptive behavior. “With a half-a-dozen townhouses, complaints were received about behavior violations multiple times,” he said. The Hatchet incorrectly reported that University President Steven Knapp met with the Foggy Bottom Association, and that the Foggy Bottom Association pressured GW to change its off-campus policies. In both cases, it was the Foggy Bottom Residents Alliance, not the Foggy Bottom Association. We regret this error.